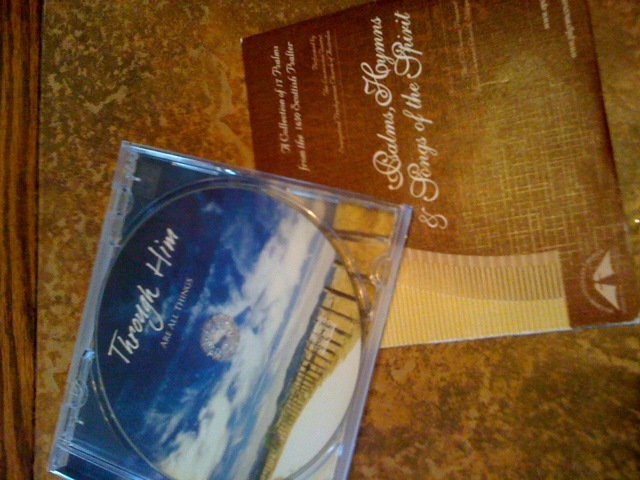 I received two wonderful CDs last week from the Evangelical Presbyterian Church of Australia’s Launceston congregation. The first is entitled “Through Him Are All Things” found here. It includes 22 different tracks with some beautiful arrangements of the 1650 Scottish Psalter. The second CD is entitled “Psalms, Hymns and Songs of the Spirit: A Collection of 17 Psalms from the 1650 Scottish Psalter” performed by the Launceston Quintet, EPCA, prepared by the Pilgrim Covenant Church of Singapore. Here is a link to the EPCA Youth as they sing some of the arrangments, also YouTube videos are linked. Here is information regarding the Launceston EPCA congregation and the times and locations of their worship services. It is so encouraging to hear congregations committed to the singing of the Songs of Zion. It is especially a blessing to hear young folks taking pleasure in singing as well. Thank you so much to Christine Coleburn from Tasmania for sending these CDs to me. This entry was posted in CD Reviews, EPCA and tagged congregational singing, EPCA Launceston, Exclusive Psalmody. Bookmark the permalink. Great! I recently started singing from the new Psalter of RPCNA. It is indeed a blessing to sing the psalms. Psalm 1 and 51 are my favourites.